Hi, guys! My name is Vitaliy and I very enjoy to draw Vehicles, Props, Military stuff, Weapons etc. 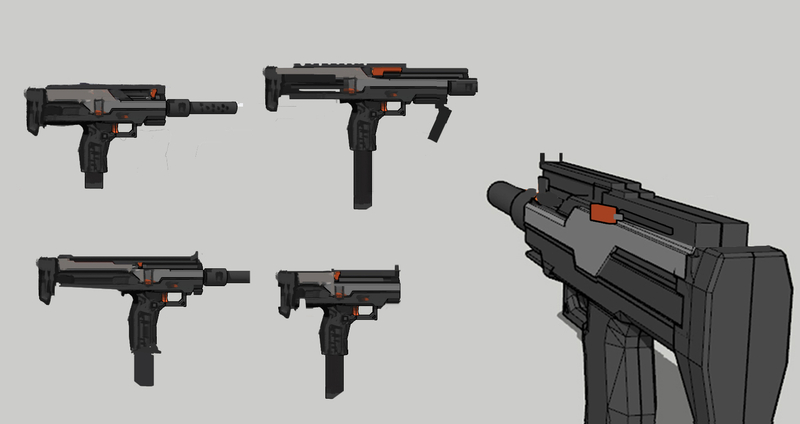 A few weeks ago I've started to make weapon concept for joy and education. At the same time, I reading book advised my friends "Composition in engineering" by Yuriy Somov - very good stuff about hard surface design, so my Concept is some sort of "homework" - I using theory and methods from this book in the decision-making process, an I hope you'll enjoy it like me. 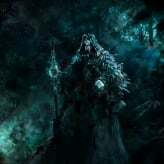 Most of the things appeared in the prosses of thinking. At that moment I didn't t have good knowledge of how guns are work, so I had to watch a lot of videos of guns disassembly, read articles about weapons and their constructions. 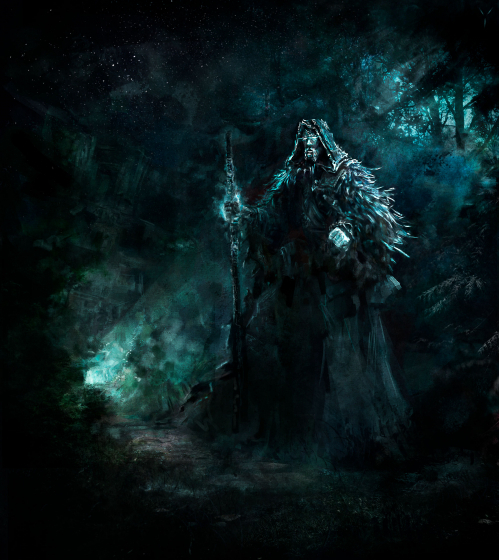 I used brush and photobashing techniques on this stage and found one good version. 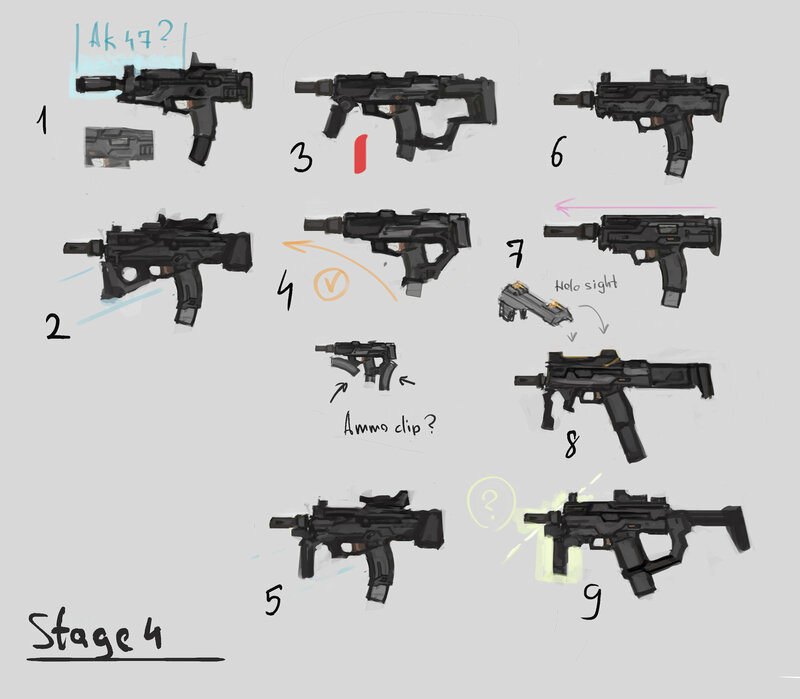 Number one was good but his forms were very static and boring and I added some changes in this prototype - diagonal magazine and grip for more dynamical shape ( now I understand what it was a very uncomfortable process of recharge ), and other stuff like a laser sight, suppressor etc. Then I continued to search shapes based on variant 3. Using theory materials from the book I understood what diagonal magazine and grip forming a triangular shape, align shapes on the same line and a "general stream" of lines or forms (1 - blue and orange lines ) is a good method to harmonize forms, to make them like a single entity. From these variants, I liked first (have a good general flow of lines, an rhythm), sight in variant seven, and 11 because it has a very compact size. 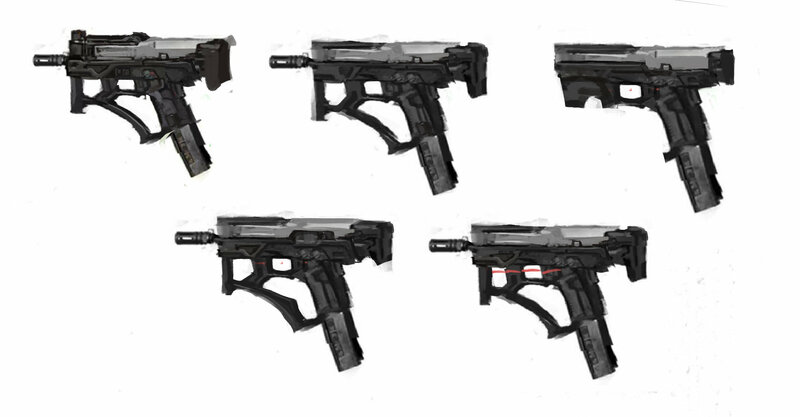 On this stage, I got an idea to embed magazine into the grip and check what happens - variant 13. I made a simple 3D model and checking the first-person view, improve and add details. 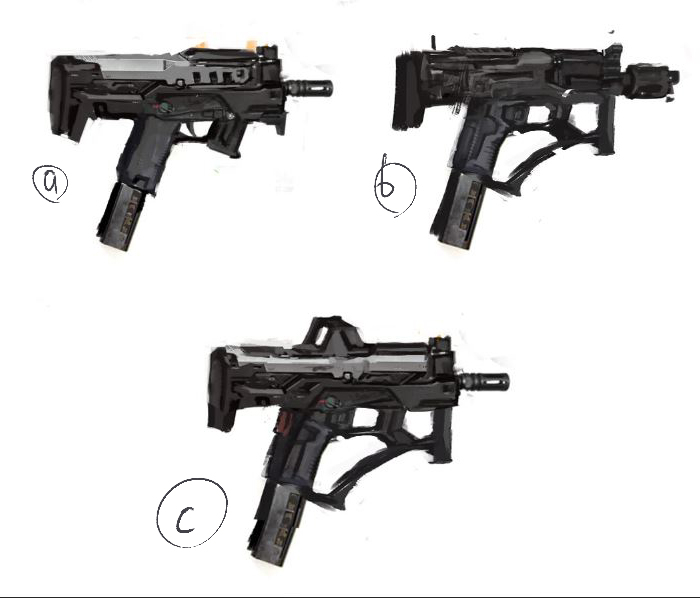 For the Machine pistol/smg I would play with the proportions a bit more. The length of the barrel is about the length of the handle with the magazine as well as some of the internal shapes. You can use a square shaped smear brush in photoshop set to 100% and just drag your shapes in and out until your proportions are where you want them to be. Thanks, Spicy for the feedback - I actually forgot about proportions ... But anyway I continued the process and made some other variants because when I did it in 3d it seems to me very boring and unimpressive. 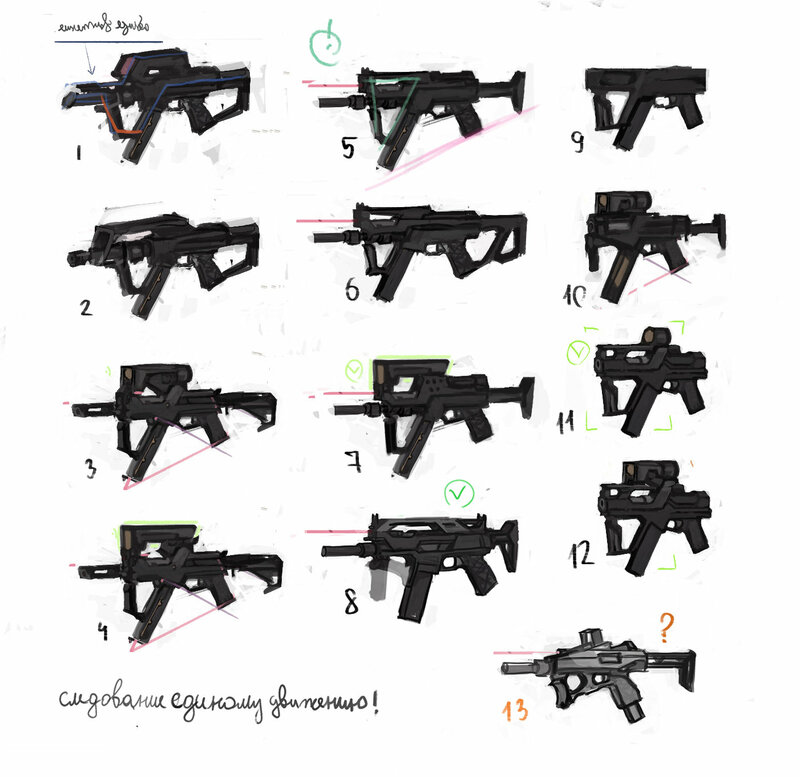 I checked some variants of main proportions and "visual flow"( variant 4 has a good dynamical align like a Steyr AUG rifle - [orange line] and triangular main form, opposite - the number 7 has a very typical but strong rectangular one with the rhythm of horizontal lines and 30/70 proportions of muzzle breaker to guns length. 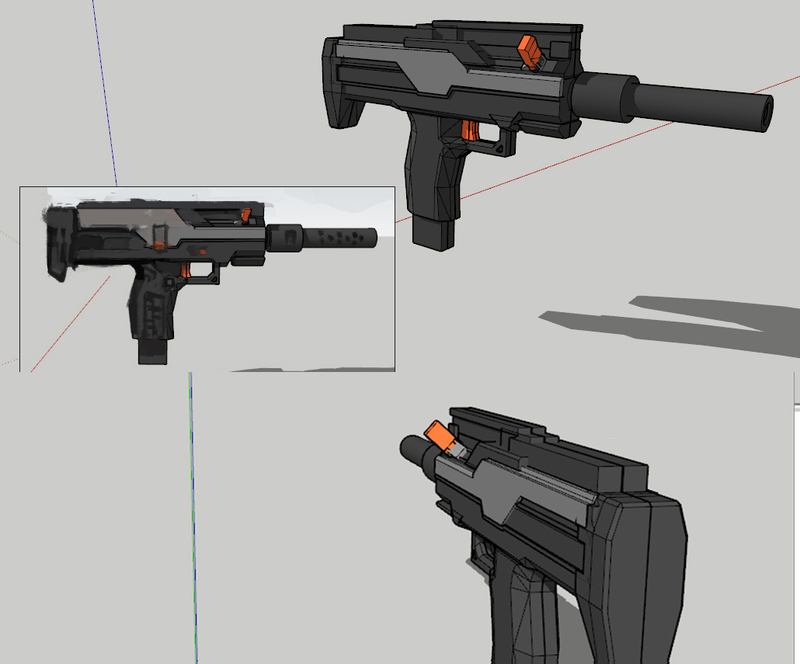 In scetch number eight I changed stuck and magazine proportions and checked idea of holographic sight on the top of it. In one moment I wondered about AK 47 and M 60 barrel shape (number 1) and added part of him for good stopping one. 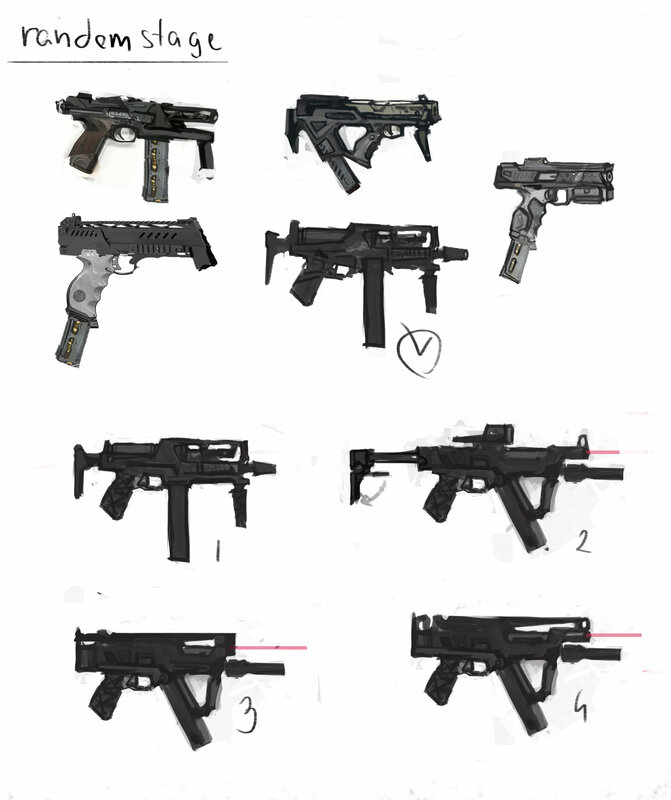 Other variants its just adding of stocks, grips, sights, other little forms for variety and searching interesting combinations.